“This will not be a Seder in the traditional sense but a journey traveled by people of good will through storytelling that sets us free to be servants of God’s love in our world” said Father Nat Katz of All Saints Beverly Hills one of the organizers of the event. What started as a small celebration 5 years ago has now grown into one of the most highly anticipated programs of the Pico Union Project; a multicultural, multi-faith, community and performing arts center in Downtown LA. The afternoon will be led by 19 community organizations – including: Valley Beth Shalom; Bend the Arc; Jewish World Watch Temple Emanuel; All Saint’s; Kwang Yum; MPAC; Camp Gilboa, Words of Encouragement Church; Beth Am and Sinai Temple. “This will not be a Seder in the traditional sense but a journey traveled by people of good will through storytelling that sets us free to be servants of God’s love in our world,” said Father Nat Katz of All Saints Beverly Hills one of the organizers of the event. 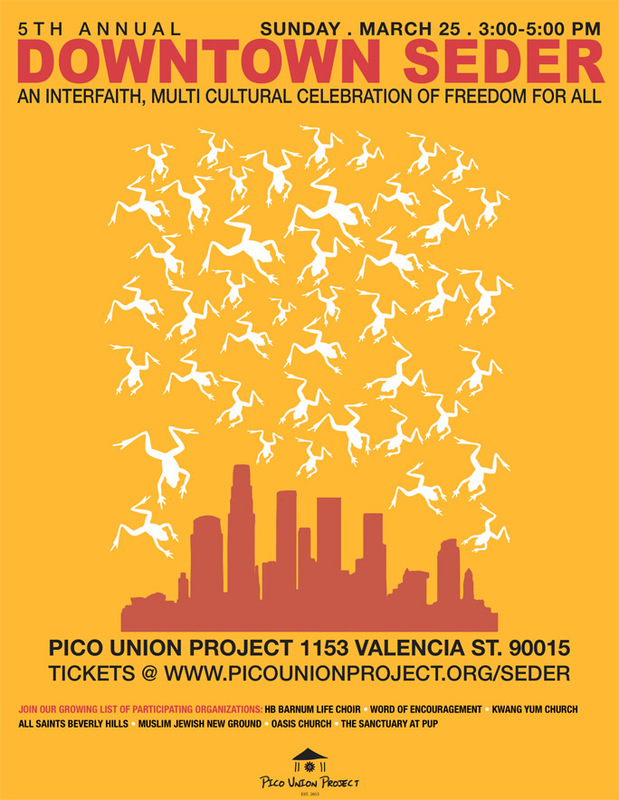 Sunday, March 25~ 3:00 pm at Pico Union Project Join us for this annual celebration of God’s work of liberation from generation to generation. We will gather as one family of many faiths, languages and cultures during a season when many faith traditions affirm that love can conquer fear and life can conquer death’s hold on our physical and spiritual selves. Originally built by Sinai Temple in 1909, the Pico Union is the oldest synagogue building in Los Angeles. 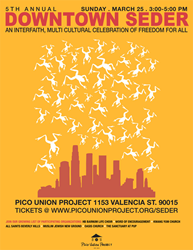 The Pico Union Project is a multi-faith cultural arts center dedicated to the Jewish principle to “love your neighbor as yourself.” We elevate this teaching into practice by bringing diverse cultures together through song, story, art, food and prayer. We partner with like-minded organizations and community leaders to help reinvigorate our neighborhood in downtown Los Angeles and reflect the Jewish value of being a light to all nations.